Two delicious layers of cake, separated using homemade lemon curd, encased in a white chocolate Swiss buttercream frosting. Does that sound good? Well, don’t forget about the raspberries on top! This cake recipe is not only easy, it’s one of the most adaptable recipes I’ve made in a while – it’s perfect for birthdays, weddings, summer days, winter days, and even just wonderful to put on a platter next to a bunch of other cakes! In fact, if you have any sort of occasion coming up, this cake (possibly with a few minor modifications) is probably appropriate! And if that’s not enough of an introduction, since I put up photos of the cake I made for my mum’s birthday, this has been one of my most requested recipes! This is Lake Louise in Banff. Pretty, right? Sorry for the delay! But I hope this very special post will make up for it. It was my mother’s birthday over the summer, and she flew all the way from Saudi Arabia to Canada so that we could spend it together (my dad was busy with work so sadly he couldn’t make it, but he and my mum are having a little holiday in France as I type this)! Of course, I wanted to do something special for my mum, something other than buying her some mille-feuille from the local patisserie shop (though she does love mille-feuille!). 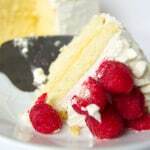 And this Lemon Curd Cake with White Chocolate Swiss Buttercream was what I finally decided on. As far as cakes go, this is a relatively easy recipe (don’t let the various components scare you, preparation is key here), that results in a lovely looking cake that you can decorate or adapt any way you like – for the more adventurous of you, I’d suggest halving the layers once more (so that you have four layers), and filling two layers with lemon curd, and two layers with raspberry jam! Of course, if lemon curd cakes might not be your thing, that’s totally cool. If you fancy something just a little more chocolate-y, try out my Chocolate Cake with Whipped Cocoa Buttercream. You won’t be sorry! If you want something unique and super indulgent, you can’t beat this Gooey Chocolate Meringue Cake! Cheesecake is always a good idea. This Burnt Basque Cheesecake is a magical recipe that’ll make you extra popular with anyone that gets a bite! Or you don’t have much time? Here’s a cake you can make in 5 minutes. Okay, okay! I get it…you want another non-chocolate option. Try out this Victoria Sponge Cake with Balsamic Strawberries. 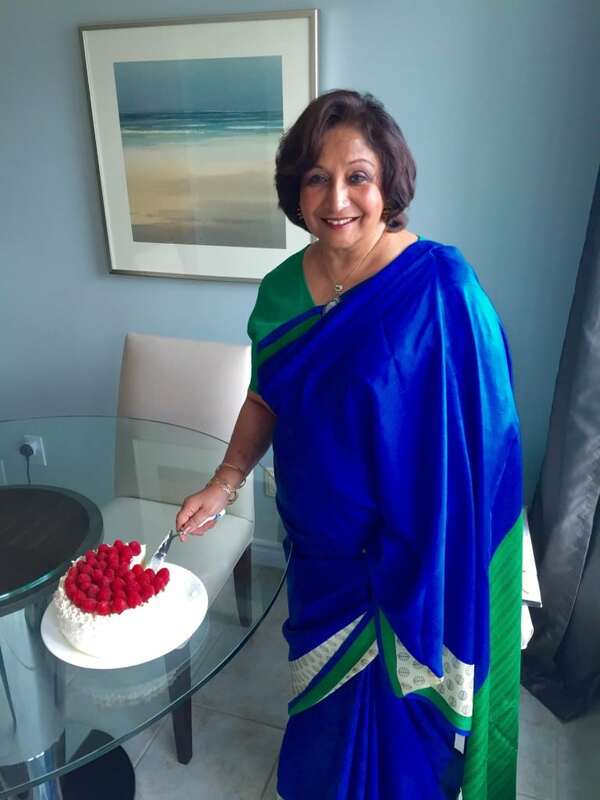 As for whether my mother liked the cake, well – you can see for yourself! Doesn’t mummy dearest look pleased? Heads up! The following are affiliate links. If you buy something through one of these links, I will receive a small commission. You won’t need to pay a penny more, but it’ll help keep my lights on! Thank you, bestie. You are awesome! Cake Decorating Tools – super handy, and will definitely help pretty up your cake! 9-inch Cake Pans – you’ll need two of these (or something similar) for the recipe! So…? What are you waiting for? Go make this lemon curd cake for someone you love! Oh… wait! Don’t go! First make sure you’ve follow me on Facebook, Pinterest, Instagram, and Twitter. Done? Great. Now go make this cake for someone you love! 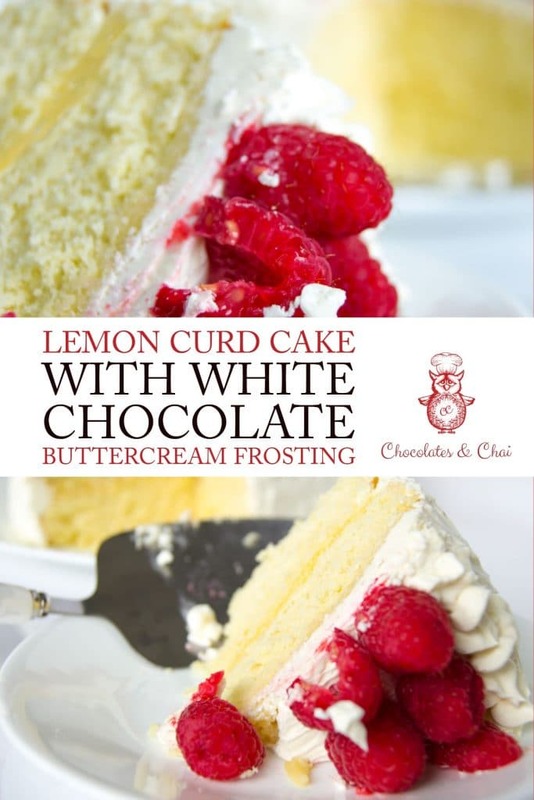 A great recipe for a delicious Lemon Curd Cake with a White Chocolate Swiss Buttercream frosting. Perfect for birthdays and special occasions! A heaping load of raspberries! Heat oven to 350°. Butter and flour two 9-inch round cake pans and set aside. Whisk flour, baking powder, and salt in a bowl; set aside. Whisk milk and vanilla in a bowl; set aside. Cream butter, sugar, zest, and juice together. One by one, add the eggs, beating well each time. Alternately add dry ingredients in 3 batches, and wet ingredients in 2 batches. (If you’re using an electric mixer, be sure to initially drop to a low speed for this… unless you like a messy kitchen. Which is totally cool. It’s your kitchen, after all!). Beat until batter is smooth. Divide batter equally between cake pans. Tap pans lightly on a solid surface to get rid of any air bubbles. Bake 25-30 minutes, or until a toothpick inserted in middle comes out clean. Let cakes cool for 20 minutes in pans; remove, and allow to cool completely (ideally on a wire rack). Whisk sugar, zest, juice, and eggs in a saucepan until smooth. Place over medium heat; cook, stirring the mixture until it thickens to a consistency similar to that of a watery pudding (approx.10 minutes). Remove from heat and slowly whisk in butter until melted and smooth. Pour curd through a fine-mesh strainer into a jar; chill until ready to use. Place sugar and egg whites in a bowl, over a pot of simmering water; stir mixture until egg whites register 140° on an instant-read thermometer. Remove bowl from double boiler; beat on high speed until meringue stiff peaks form. Gently mix in softened butter to meringue; beat until smooth. Stir in white chocolate, vanilla extract, and salt. Place one cake layer, curved side down on a cake stand and spread with ½ cup lemon curd; place top layer curved side up. Use the white chocolate buttercream to ice the cake as you please using a cake spatula (or a large spoon if your kitchen is as bare bones as mine! ), and a piping bag if needed. 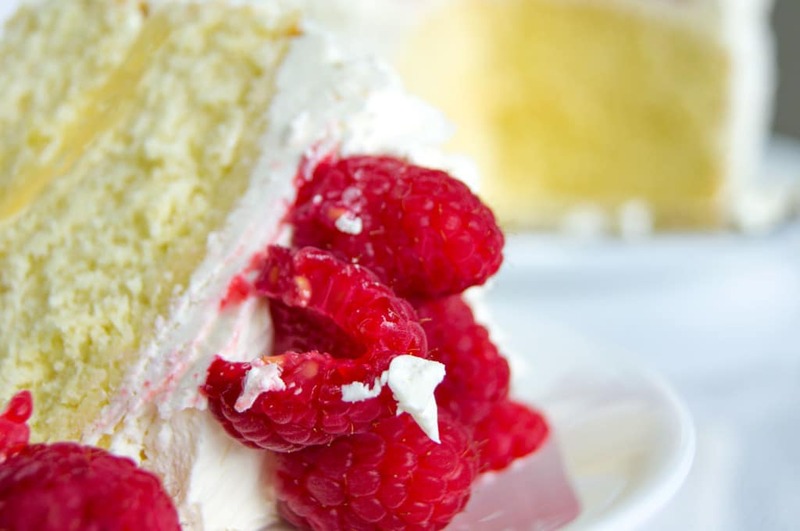 Garnish the top of the cake with fresh raspberries. Refrigerate to allow the icing to set (about 45 minutes). Serve at room temperature. 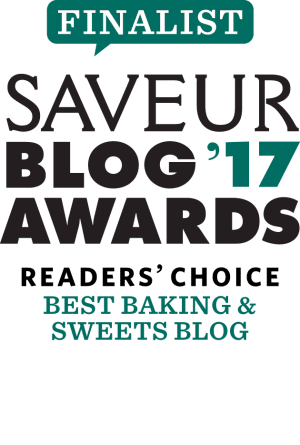 In case you find it helpful, here’s a White Chocolate Buttercream Frosting recipe post that provides more information! Gorgeous cake, and that lake is breathtakingly beautiful! Glad you found my blog Yasmin! Thank you for the kind words. I hope you enjoy the recipe! This cake looks delicious – I feel like it’s one my mother would love too! 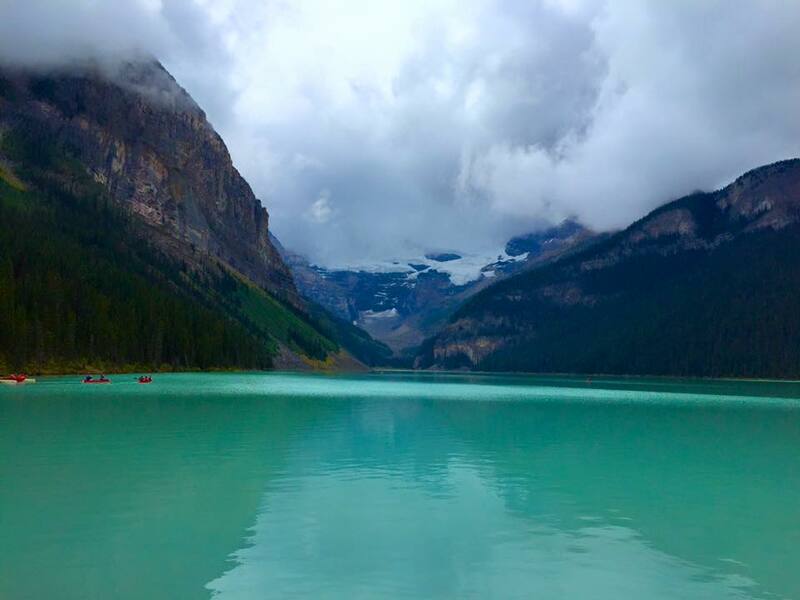 Beautiful photo of Lake Louise as well – I went there as a kid and have been dreaming of going back! 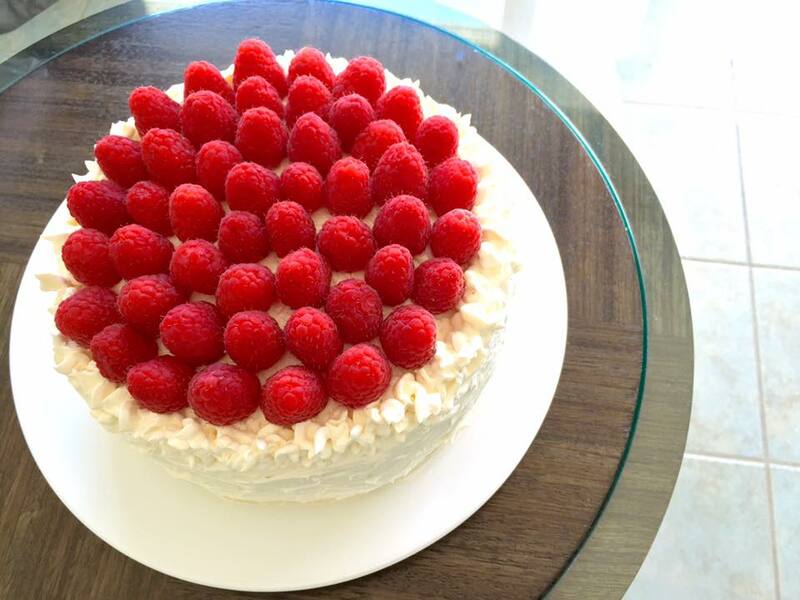 Raspberries and white chocolate! A winning combination already. Your cake looks delicious – I am sure that your Mom loved it and that it is asked for annually! Thanks Denise! My mum asks me to come up with a new cake recipe for her every year! lol! This is such an irresistibly delicious cake. 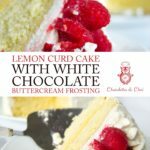 I love the combination of flavours – the lemon curd with the white chocolate buttercream and the texture is so silky smooth. Best of all is the happy look on your mom’s face – you made her day so special! Can I add the raspberries to the top of the cake will sit for 24 hours? Or will they bleed? Will the frosting be too hard to add fresh berries just before serving? Hello ! I absolutely love your recipes you’re the first site that I go to when I want to make something! But this time I have a question. I don’t understand very good English plus I’m new in baking but I don’t get what I’m supposed to do with the bowls at the cake part. Mix the flour, in another bowl mix the wet ingredients but where do I mix the butter etc? And what do I do with it afterwards? Thank you so much for everything you are amazing! Hey Nataly! Thanks so much for commenting! And for reading my recipes! So, you have initially two separate bowls – one with flour, baking powder, salt; and one with milk and vanilla. In a THIRD bowl you’re going to cream the butter with the sugar, lemon zest and juice. You’re going to add bowls 1 and 2 into bowl 3 (with the butter) in order to make the final cake batter. Hope that helps!